Why no, that post title is not a typo! In case you missed the good news, Showa Genroku is getting a second season, something I never thought I’d be writing and am positively giddy to be doing so. Given that the manga is scheduled to wrap up sometime this summer, it’s likely the production staff had this planned out as a complete, two-part adaptation right from the start. 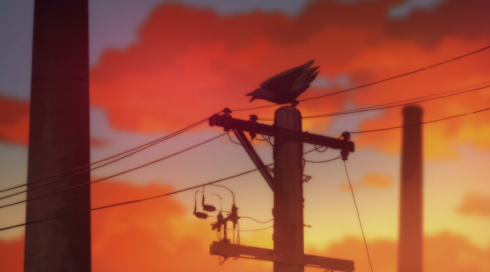 Thank the anime gods for risk-takers and passion projects, that’s all I can say. 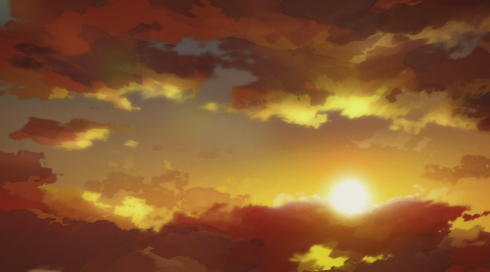 Before we dig into the story itself, allow me a moment to say that I loved this episode and found it incredibly moving, both in how it depicted Kikuhiko and Konatsu’s grief and the way it provided glimpses of a path forward where our characters could finally find peace and perhaps happiness again. Death and tragedy is often less about the event itself than about how the survivors react, and SGRS depicted that with a quiet, sharp sadness that only made it hit all the harder. Listening to Konatsu sing her favorite rakugo piece, or watching Kikuhiko shut down because “being alone” is “the only way to survive” his own grief and guilt, tying his professional mask on so tight that he forgets what his original face looked like in the first place–it’s heartbreaking to see, especially given what it does to their own relationship. What happened was a terrible accident, but neither Kikuhiko nor Konatsu can accept it as an accident, and so they both pile blame on top of Kikuhiko, which turns them more bitter and isolated than before, haunted by unspeaking, smiling ghosts and unable to even take solace in the others’ presence. I’ve talked a little before about how Kikuhiko/Yakumo and Konatsu are more similar than they want to admit, and that provides the emotional core of the episode, I think. Yakumo tells Sukeroku’s ghost that Konatsu is strong, “unlike either of her parents” (a cutting albeit true statement), but what he doesn’t realize is that she gets that fortitude from him. Both are fiercely independent survivors, a trait that allows them to move forward even when they’ve lost so much, but also makes it difficult for them to open up to and rely on others. They are also both people trapped by cultural expectations they despise and lives they don’t want. Kikuhiko has no desire to be the next Yakumo, but he takes on the title anyway, for what I see as two contradictory reasons: One, it gives him the power to find a way to fulfill his promise to Sukeroku and help his friend “rest in peace”; and two, if needed, it allows him to let the Yakumo title (and all the suffering it’s caused) die when he does. Konatsu, meanwhile, doesn’t want to be with Kikuhiko and she certainly doesn’t want to be cut off from rakugo, but her age and gender severely limit her options. 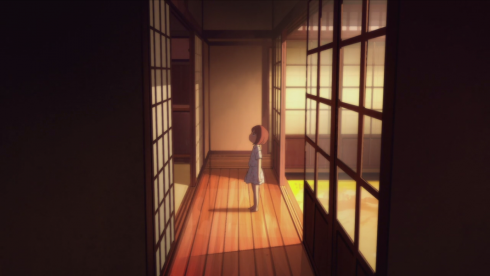 (While I think Kikuhiko’s constant discouragement of her rakugo practices comes from a place of misguided kindness–he wants to spare her the pain and disappointment he thinks will come from it–it’s especially frustrating when we remember that he was denied a place in the geisha house because of the body he was born in, too. And thus the gender-restrictive cultural cycle continues.) Stuck in her current situation due to her own “tragedies of circumstance,” her helplessness turns to hatred, and she sets her sights on a vengeance that Kikuhiko would be only too happy to let happen. And oh, look–my heart broke a little more while I was talking about it. I rewatched the premiere before writing this, and if you have a free hour this week I recommend doing the same. In addition to noticing all the cinematographic touches that later crop up in Yakumo’s story (visual echoes similar to the echoes our past timeline leaves on our present), knowing Yakumo’s history gives his “fickle” actions a lot more emotional resonance. Yotaro’s cheerfully aggressive approach is reminiscent of the way Sukeroku marched up to the old master’s door, and Yakumo makes it a point to ask if Yotaro has “nowhere else to go” before he agrees to take him in. 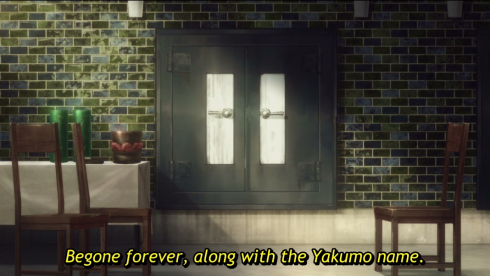 Yakumo has a deep sympathy and fondness for fellow strays, and his desire to keep others from “being abandoned” has a strong influence on his decision to take in Yotaro and raise Konatsu. In the premiere, Yakumo also presents us with his goal and his threat. 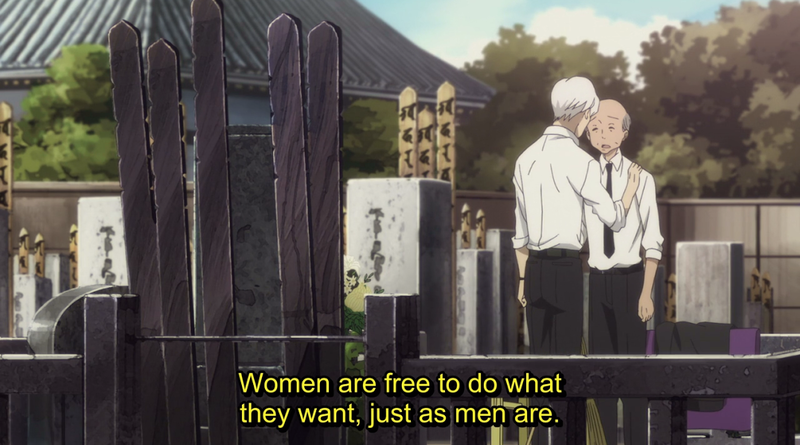 The goal: To fulfill the promise he made to Sukeroku so that his friend can finally pass on. 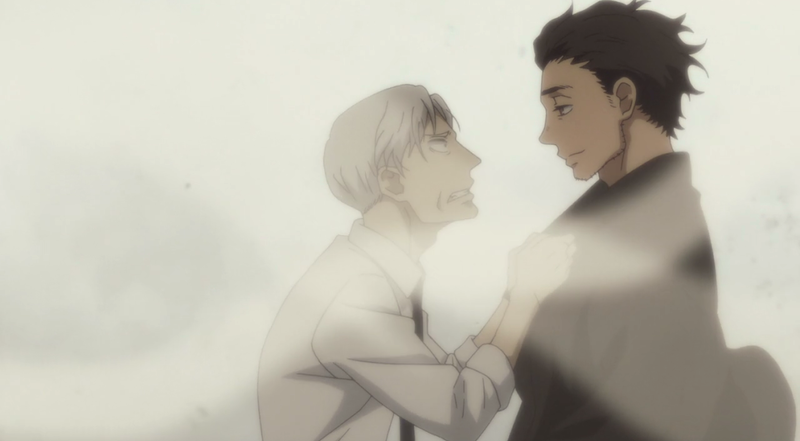 The threat: If Yotaro can’t help him do that, then rakugo dies with Yakumo. 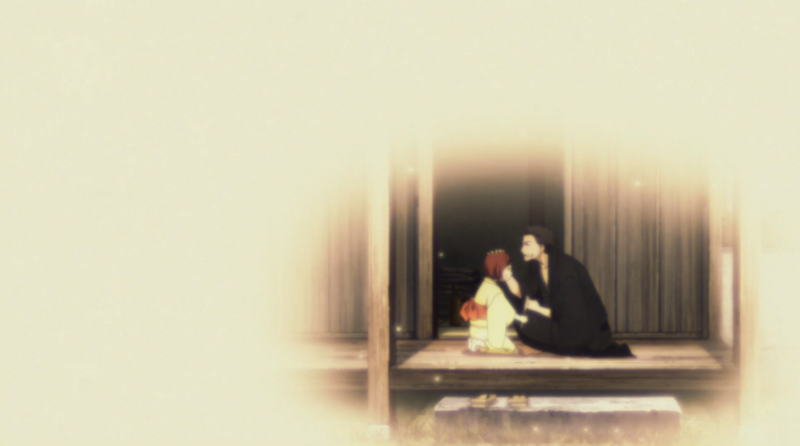 Our storyteller has always had a love/hate relationship with rakugo, and that’s only intensified over the years due to the trauma of his best friend’s death. He wants to save the art, but he also feels that he and the unchanging, tradition-bound Yakumo line can’t be (don’t deserve to be?) the ones to make it happen. It’s that other rakugo shinju (double-suicide) I mentioned in Episode 10, and it takes precedence in this finale as well. Speaking of that Episode 10 post, its central theme of “inheritance” is back front and center this week, too, in terms of bloodlines and cultural traditions/art forms alike. We’ve jumped forward a generation, and as time marches forward so too do the legacies people leave behind. 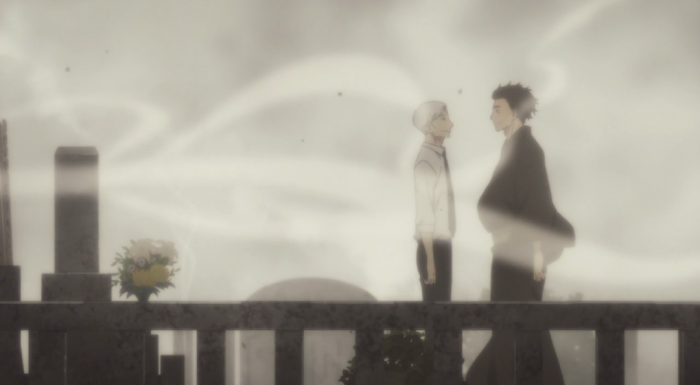 This finale is all about the interconnected nature of life and death, of change and stasis, best demonstrated when Yotaro shifts from learning about Konatsu’s pregnancy to visiting the Yurakutei Family Grave, tying past to present to future in one long, rakugo-centered line. The idea of change is central to SGRS, along with the question of whether something is preserved like a bug in amber (and, ultimately, just as lifeless) or if it’s allowed the freedom and dynamism to change and grow along with the rest of society. 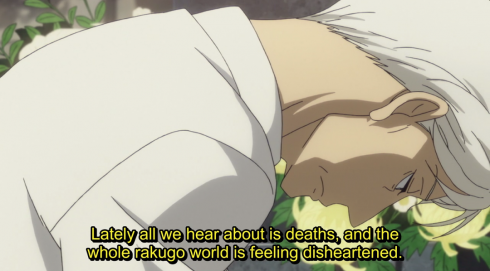 The old rakugo president laments the cultural changes occurring around rakugo, but Kikuhiko accepts them (albeit cynically), understanding that their organization “can’t control” the “flow of time.” Yet he also sees himself as unchanging, frozen in a long-ago moment, emotionally severed from the people and world around him. 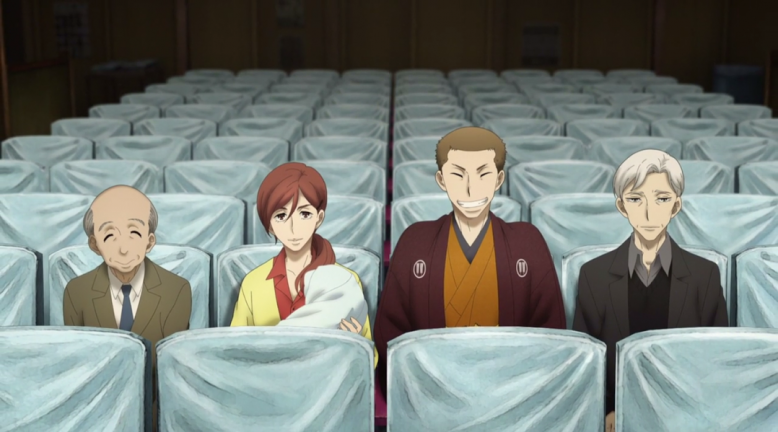 Despite Kikuhiko’s unwillingness or inability to change, and despite rakugo’s current stagnation and slow death, there are signs of life, promises of rejuvenation. They’re depicted in Yotaro, a veritable embodiment of change this week with his spiffy new haircut, small but lively audiences, and promotion to shin’uchi; as well as in Konatsu, with her stubborn rakugo practices and determination to carry on the (idealized) image of her father. And, importantly (and despite Yakumo’s claims), there are signs of change within him as well. Where our last generation of young performers were limited by a master obsessed with legacy who wanted to preserve the ways of the past, our current Yakumo could care less about tradition. 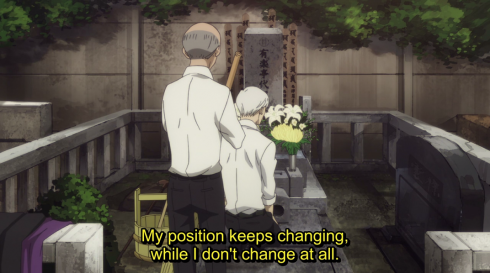 He may not believe that he has the power to change anything, and he’s often driven by a defeatist attitude that thinks rakugo is doomed and Konatsu’s love of the medium will only bring her pain, but he’s also not going to actively prevent others from changing things, either. He’s a strict teacher when it comes to “drinking and having fun” (likely a reaction to watching Sukeroku struggle with alcoholism), but he accepts Yotaro’s cheerful nonconformism and doesn’t sweat the small stuff like having his promotion leaked to the public. Yakumo also defends Konatsu’s independence, admitting that while he personally isn’t happy about her single mother status, he’s going to respect her wishes even so. His hands-off approaching to parenting and “do whatever you want” mantra is an awkward attempt to give her the same freedoms a man has (and then some, given the restrictions placed on his own life while growing up). 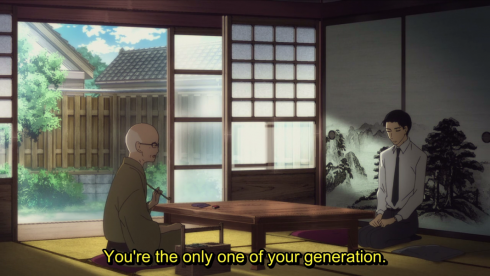 Our Yakumo may be able to save rakugo simply by doing what older generations so often won’t: By getting out of the way and allowing change to happen naturally. The other Big Idea this week is one we’ve seen before as well, although I haven’t touched on it much: The importance of names and how they influence people. Most of our characters possess both a real name and a stage name–the latter of which can also change depending on their position–and the knowledge of that real name provides a kind of narrative shorthand for emotional closeness. Kikuhiko and Sukeroku had the closest relationship because they could cut through the stage names to the real one. Kikuhiko and Miyokichi didn’t know each other’s real names, making it difficult for them to communicate or truly understand one another. 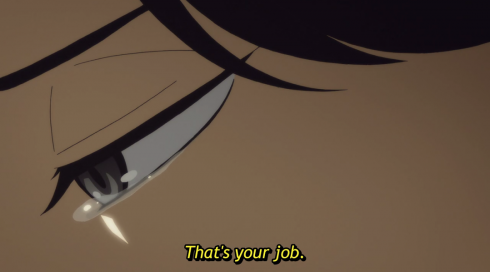 And of course there’s that gut-punch of an ending line to Yakumo’s story, where he admits to burying himself so deeply in his professional name/role that no one (not even he himself) has access to that grumpy, insecure, warmhearted caretaker called “Bon” anymore. Yakumo sees this as a difficulty of the art form, apologizing to his apprentice for giving him a new name and turning him from a “Kyoji” into a “Yotaro,” but Yotaro is happy for the change. “Being human means changing whatever way it takes to suit your name,” he says, which sounds surprisingly confining but isn’t, not exactly, when we remember that Yotaro asked Yakumo to take him in. He wanted a new start, a new direction, and by giving him a new name Yakumo gave him the opportunity to do just that. More importantly, Yotaro is now a shin’uchi, with more freedom and agency than before. 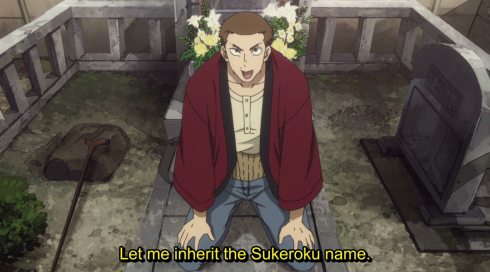 By choosing to take the Sukeroku name, he’s trying to define the path he’ll walk while looking for “his own rakugo.” Yakumo says that people adapt to fit a name, but that’s because he’s always accepted the names foisted upon him, never taking one of his own volition. 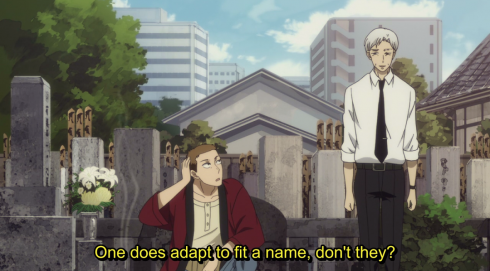 But if you choose your own name, then it’s not about fitting someone else’s expectations (as Yakumo did throughout his young adulthood), but about setting expectations for yourself and working to fulfill them. Yotaro is the optimism and hope this story so badly needs, a loyal young man who wants to make his family (Yakumo and Konatsu) happy and proud, but in a way that doesn’t compromise his own goals and needs. 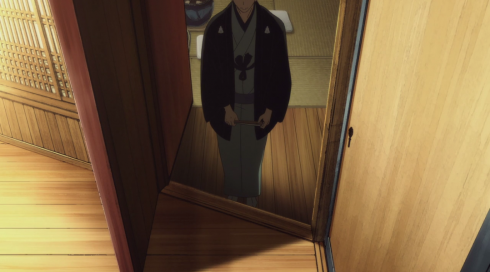 I’m looking forward to seeing how his skills grow, his relationships develop, and especially how his presence changes the people around him, shaking them from their decades-long cages and spurring them forward towards a future that, with any luck, will see both them and their beloved rakugo thriving again. It’s such a relief to know we’ll all be able to watch it happen together. Best thing about getting a season two? More Seki Tomokazu acting at me. Hands-down. This might just be my imagination, but it seems they’re drawing Yakumo a little differently now than they did in the premiere. His hair may have gone full white, but his face looks younger, more Kikuhiko-like, than it did initially. 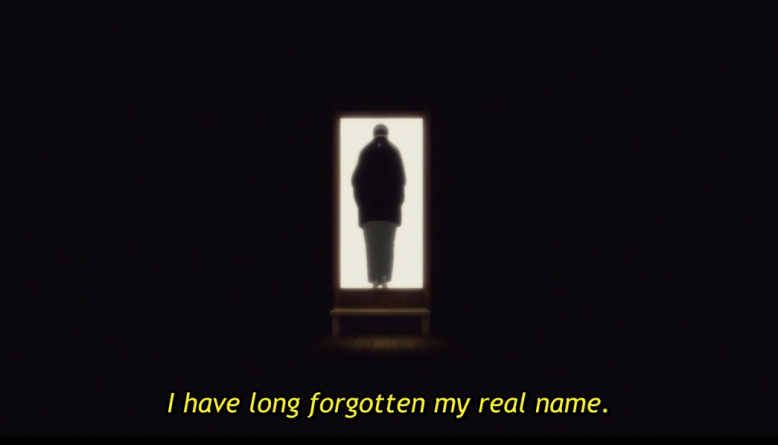 Given that the staff has used drawing styles to express character before (Miyokichi’s face changes to reflect the shape of the man she’s with, as one commenter astutely noted), I wonder if this is supposed to suggest that the act of telling his story has allowed him to remember some of his “real” self again. Act II will tell us more, I s’pose. I love the way the script and blocking really hammer home the parallels between Kikuhiko and Konatsu. 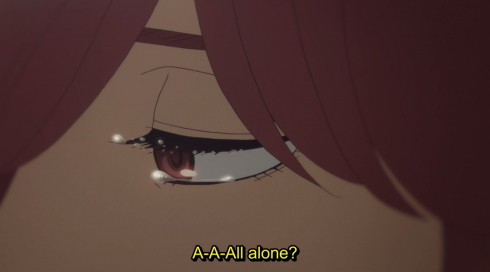 Her insistence that she’s fine by herself and has no intention of marrying–all while looking away as her more outgoing companion watches from across a pair of drinks–is a brilliant little mirror of Kikuhiko’s own “I’d rather be alone” speech to Sukeroku. I’m not completely buying this one, either. Fun fact: Our return to the present timeline begins with a barbershop and Yotaro getting a haircut, and so did the premiere episode! Little touches like that assure me this show is going to have fantastic rewatch value. Thanks everyone for sticking around through my weekly essays, and thanks as always to the Evo staff for giving me the freedom to talk and talk (and talk!) about a series I love. SGRS was a heck of a blogging challenge, but I’m glad I got to tackle it, and with any luck these posts were of some value to you all as well. As of now we don’t know when Act II will air, but barring any unforeseen events I will definitely be back to cover it. Hope to see you all there again, too!